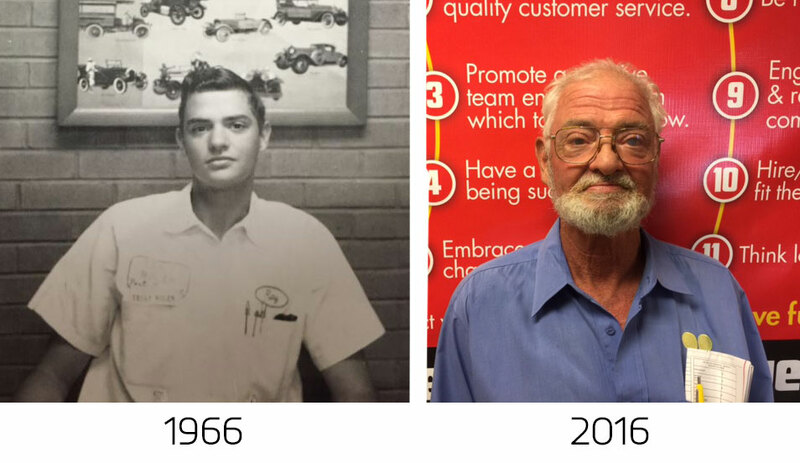 Truly Nolen Pest Control Technician Ray Rogers, who started with the company on September 15, 1966 at its Phoenix service office at the age of 17, is celebrating his 50th anniversary with the company. Rogers, who has always worked out of the company’s Phoenix service office, originally started as a termite technician, but after six months, he switched to general pest control and has kept the same route and territory ever since. Rogers said he has seen Mr. Nolen at least 20 times over the last 50 years and has flown with him on his private plane before to help bring trucks from Tucson to Phoenix. Blessed with a wife of 36 years and four children, Rogers said one of the reasons why he has not retired as of yet is because he enjoys moving around and not staying in one spot all day. “From bees and mice to bird work and roaches, I’ve helped my customers have peace of mind throughout my career, which is one of the things I’m most proud of in my career,” said Rogers. When asked what advice he would give to someone in terms of remaining with a company for a long time regardless of the field, Rogers said meeting challenges and taking them in stride has kept him going for 50 years.